I’ve been a very loyal user of the music streaming service, Rdio, for the last year. I tell people about it every chance I get. They even sent me a tote bag just for asking on Twitter. However, the more people that join Spotify, the harder it becomes for me to seamlessly share music with my friends, and I have been considering switching for this sole reason. I wailed a cry for help, and neither company was listening. If they were, circumstances might be different, and they could have gained a loyal fan/kept their current user happy. If Rdio or Spotify were monitoring their social mentions, one of them easily could have jumped into the conversation to try and address my needs. And no… I haven’t switched to Spotify yet. 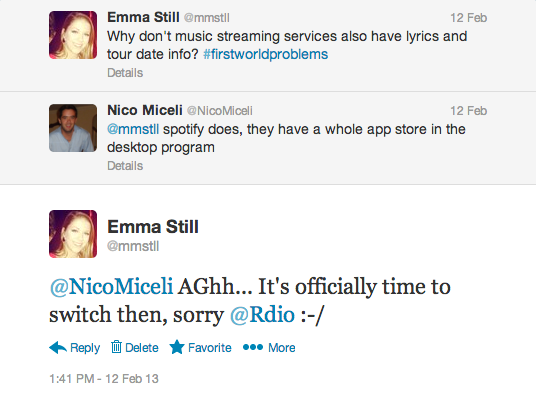 Much like a tumultuous romantic relationship, I may not like Rdio right now, but I still love them. Le sigh. 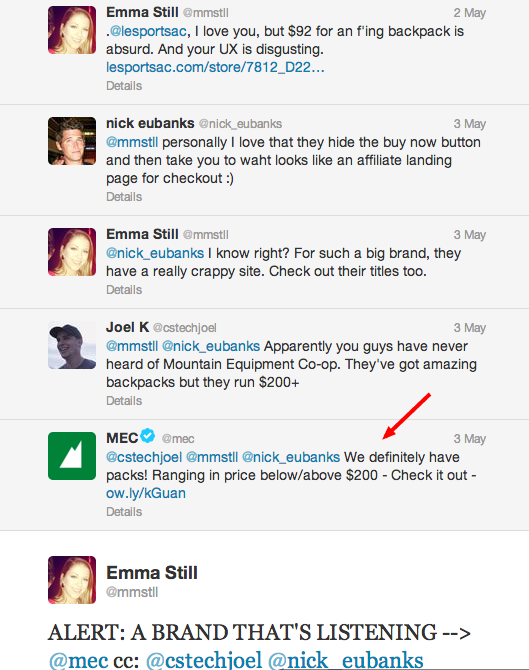 Granted, I did not buy a backpack from MEC, because I would prefer to spend $200 on 20 pitchers of margaritas, or a dog, or a bike, or 40 messages written in exotic Indian spices. BUT, I am now aware of their brand, I appreciate the fact that they were listening, and I am much more likely to purchase from them when I’m ready to spend $200 on a backpack. 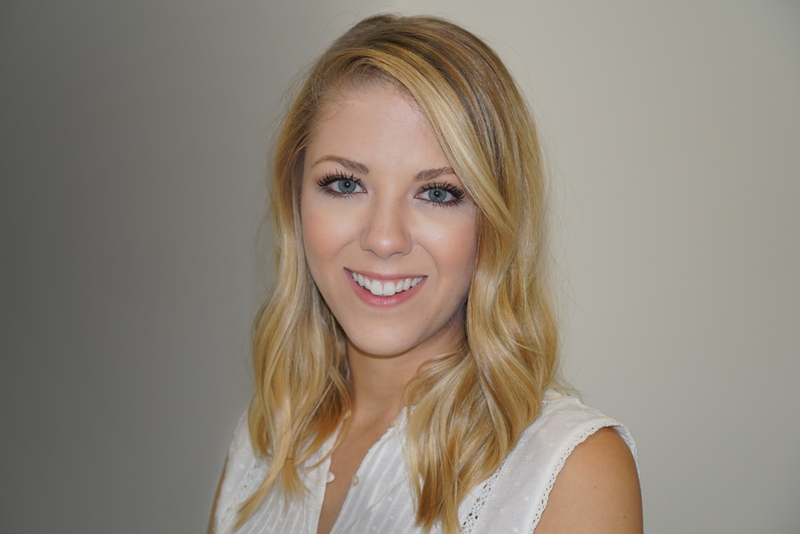 To help find mentions of your brand, RavenTool’s Courtney Sieter gave a great presentation at Social Media Explorer’s “Go To Explore” conference about listening to your audience called The Art of Being Interested. She outlines a ton of ways to monitor mentions, analyze fans and users, and measure effectiveness. Listen to what your competitor’s audience wants. Provide them with what your competitor can’t do, hasn’t done, or won’t do. Love your articles and my coffee in the morning, perfect combo! Keep all the great info coming : ) Thanks. So glad you enjoy them! Thanks Mark! So true! I can’t believe how some brands aren’t even listening for mentions of their own brand names, let alone related keywords. I made the decision I won’t buy Buffalo Jeans anymore after customer service failed to respond to phone calls, emails OR twitter messages! On the other hand, no other brand was listening on Twitter either to reach out and gain a new customer. Yeah, perfect example! If another clothing company was monitoring Buffalo mentions, they could have stepped in to the denim rescue! Dave Kerpen of Likeable Media tells a story about this phenomenon all the time and how effective it can be. He’s used it in a few webinars and other instances, but you can read about it here- http://www.davekerpen.com/blog/how-one-tweet-and-one-like-led-to-over-10k-in-revenue.html. Long story short he was in Vegas and complained on twitter about a particular hotel and a nearby hotel was listening. They didn’t try and get him to head over to their hotel or anything, just said they were sorry to hear he was having a bad experience and hoped the rest of his stay was better. In the end it made the hotel a good chunk of change in the future from that one simple twitter engagement.